Warrior pose does not intimidate this kid. A new yoga pose: Upward goat. Don Kim is the man with the goat on his back. Here's how our Yoga With Goats class worked in Howard County, Md. About seven goats, all of them born this past spring, joined a dozen or so humans in a pen. The fee was $35 per human. The kids were ... adorable! As yoga instructor Janice Ingson deftly led us through various poses, the goats nuzzled us and nibbled on our clothes and belongings. One goat tried to eat a woman's ponytail, which was quickly discouraged because the goat could have given her a haircut. We were forewarned not to stick our fingers in the goats' mouths because their bottom teeth could draw blood. We were also forewarned that goats might poop and pee on yoga mats. Which did happen. But the goat wranglers had spray bottles of disinfectant on hand, so no worries! Ingson freely admits that the whole thing is a bit "preposterous." But she had a big grin even as she told her students, "There's a lot going on here. Can you bring your awareness back to your body?" Sorry, that's hard to do when you're surrounded by cute little kids. In one magical moment, a goat climbed on the back of Don Kim while he held a hands-and-knees pose. It was "a little uncomfortable," says Kim, who lives in Germantown, Md. "But the fun outweighed the discomfort." It was also perfectly in line with what goats do. "It's just natural behavior," says goat specialist Susan Schoenian of the University of Maryland College of Agriculture and Natural Resources. "They love to climb." 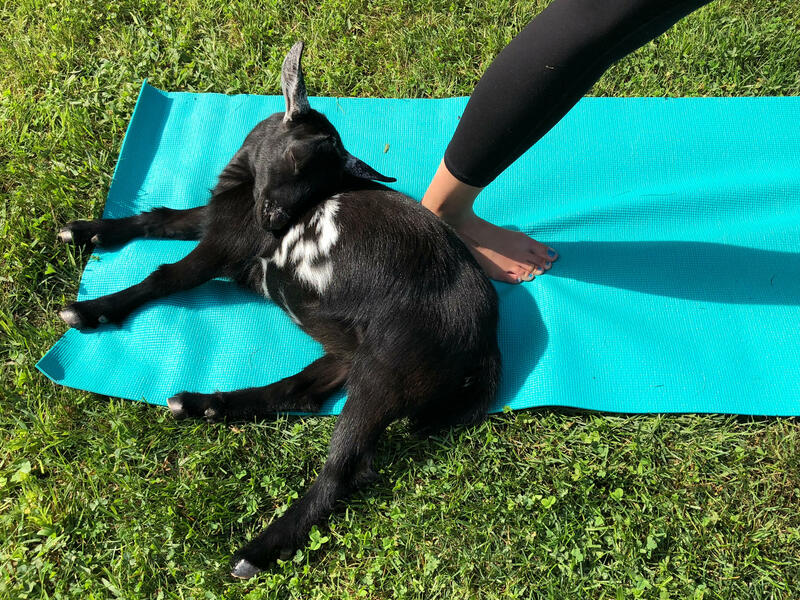 Now, you may be wondering, who had this bright idea to bring goats and yoga together? Yoga Journal credits Lainey Morse, who has a farm in Albany, Ore., as an early adopter: "A cute idea to host a yoga class at her farm ... while baby goats pranced around the mats has turned into a phenomenon with a more than 500-person wait list." Aside from the fun factor, what's the benefit of doing yoga with goats (or cats or llamas or horses, to name some other animals that have been brought into the yoga circle)? I couldn't find any research on goat yoga. As for the therapeutic benefit of interacting with animals ... well, there's not much definitive research on that either. A comprehensive Washington Post article on "therapy animals" notes that research "sometimes has shown positive short-term effects, often found no effect and occasionally identified higher rates of distress." The article also points out that people who hang out with animals often say it makes them feel better. And how can you argue with that? Even without research on goat-human interactions, different institutions are willing to give goats a try for the sake of the betterment of humanity. In Maryland this past May, Albert Einstein High School brought in 10 goats for students to pet as a way to cope with the stress of standardized tests. There's also a business side to all of this. 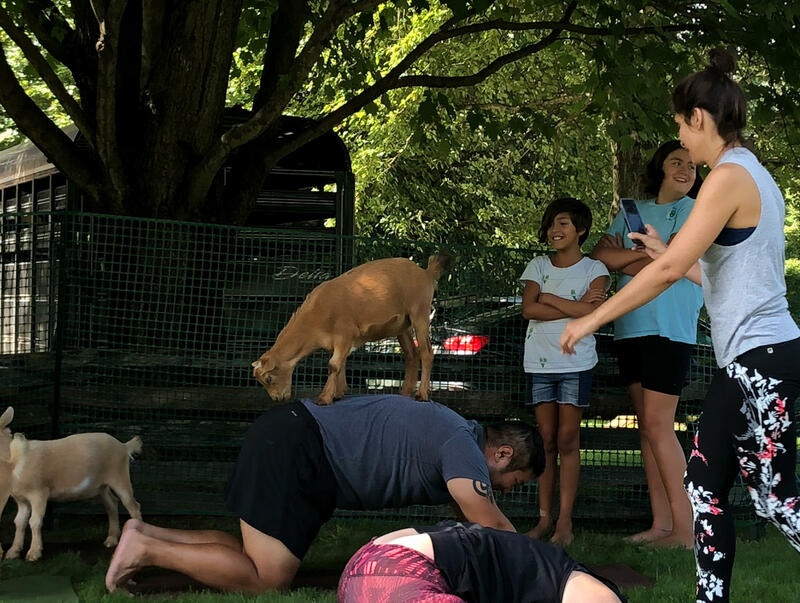 For folks who own a small group of goats, renting them out for a goat yoga class is a good way to increase their income stream, Schoenian notes. In the low-income countries that we cover in this blog, goats are valuable for another reason. They can provide a family with milk or meat — and a source of revenue. I could not find any reports of goat yoga in non-Western countries. Although a newspaper in India has posed the question: "Goat Yoga is the latest craze in the U.S.; do you think it would work in India?" Goats and Soda readers, if you've run across goat yoga in the developing world, let us know!